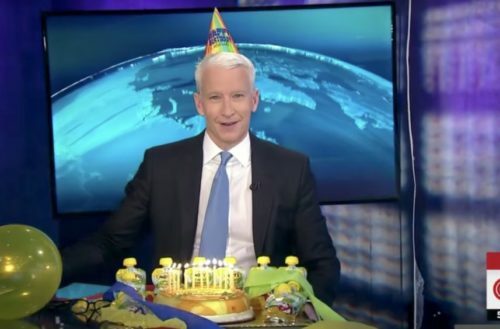 June 2 is the birthday of everyone’s favorite silver fox, Anderson Cooper. 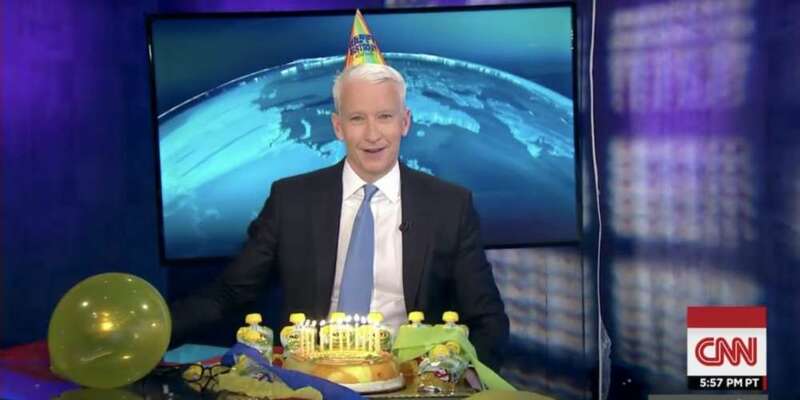 To celebrate, Cooper’s CNN compatriots teamed up with his friends to give him a birthday surprise live on air. Unfortunately for Cooper, he’s quickly overtaken by a barrage of sound effects. He realizes something’s up when he’s completely drowned out, and his co-workers let him off the hook. They throw up a superimposed “Happy Birthday” on the screen, and bring him a cake. But that’s not all — not only does he get a cake, and his new favorite snack, applesauce in pouches, but he got a phone call from his friends Andy Cohen of Watch What Happens Live! and Kelly Ripa of Live with Kelly and Ryan. Anderson Cooper’s reaction through all of this is adorably awkward. He doesn’t seem sure of what to make of all the chaos surrounding him. It’s funny to see him so flustered. He even tries a science experiment — what happens when you hold a balloon over a lit candle. As it turns out, it bursts and blows out all the candles. Bill Nye would approve. Thankfully, this three minute segment isn’t the only celebrating Cooper will be doing. Cohen and Ripa both invite him over to Cohen’s place for a party. It’ll be a dual party — Cohen’s birthday was the day before. We hope that Cooper, Cohen and Ripa had a blast at their party last night… and that they’re not too awfully hungover this morning.